"SEE! Men Turned Into Zombies! SEE! Woman-Eating Cobra Plants! SEE! Strange Voodoo Rituals! SEE! The Bridge Of Death!" This 1957 camp horror film was filmed on the island of Kawaii, Hawaii, though it is set in the South Pacific. Phillip Knight is a world-renowned debunker of so-called magic and supernatural occurrences, which he finds to be usually dreamed up by men with overactive imaginations. Knight is hired by a property developer to visit an island said to be plagued by a voodoo curse. As he seeks to find the source of bizarre events on the island, Knight will soon see that its inhabitants take the art of voodoo very seriously. Dodging man-eating plants and magic at every turn, his new mission will be to escape alive. 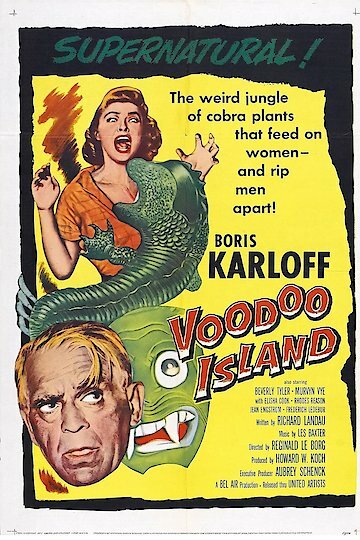 Boris Karloff, Beverly Tyler, Murvyn Vye, Elisha Cook Jr.
Voodoo Island is currently available to watch and stream, download, buy on demand at Amazon Prime, FlixFling, FlixFling VOD online.